It started in the ninth century as a dance to avoid earthquakes. 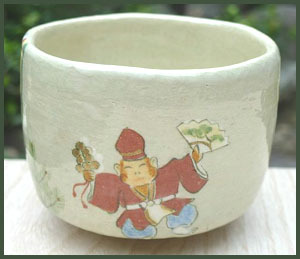 It is also performed during wedding ceremonies or other auspicious events. At the beginning of a puppet theater evening, it starts the program. 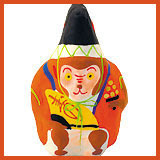 It is the figure of an old man, "Ogina 翁 " in the Noh theater, performed by an actor of Kyogen comic interludes.. 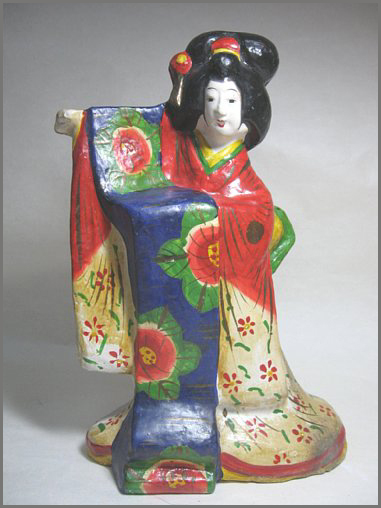 The dancer is clad in a special robe with a large eboshi hat and holds a fan and a bell. "We are fortunate that this generation has gained peace." 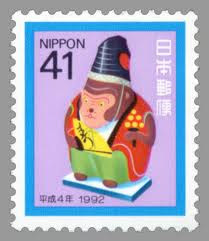 In Kabuki, the Ogina performs the dance by himself.
. Kyogen and Sanbaso .
. Stamps with Folk Toys 切手 . 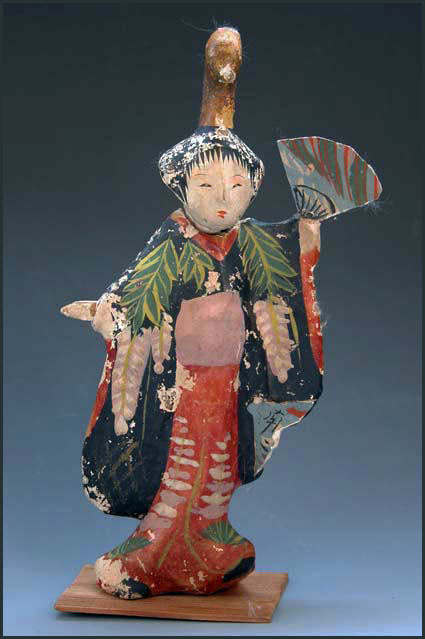 clay doll, about 27 cm high.
. Miharu dolls, Fukushima 三春 . 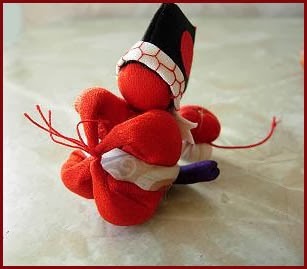 ..... 'Nuno-zarashi’ is not the name of a particular dance, but rather a technique seen in Kabuki and traditional Japanese dance, which involves the waving about of two long strips of cloth in the air so as not to let them touch the ground. 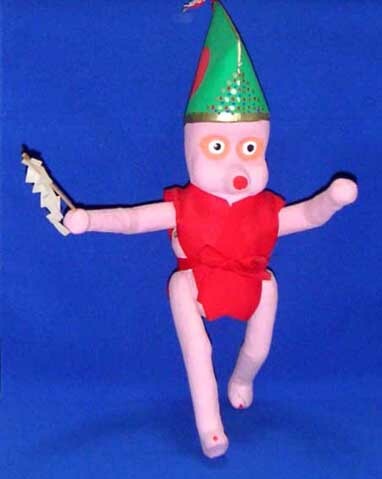 The performer usually wears high ‘geta’ clogs. 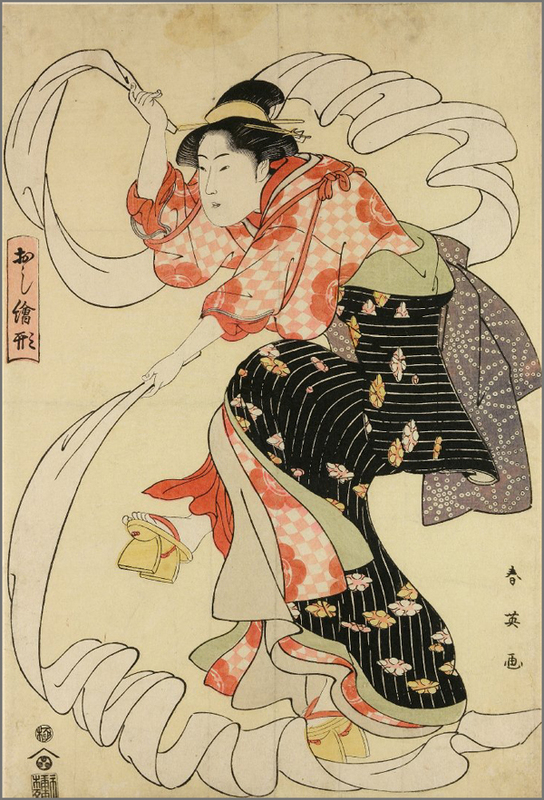 It is based on the idea of women washing cloth and then bleaching it in the sun, hence ‘nuno’ (布, ‘cloth’), and ‘sarasu’(晒す, sarashi, to expose to the air’). 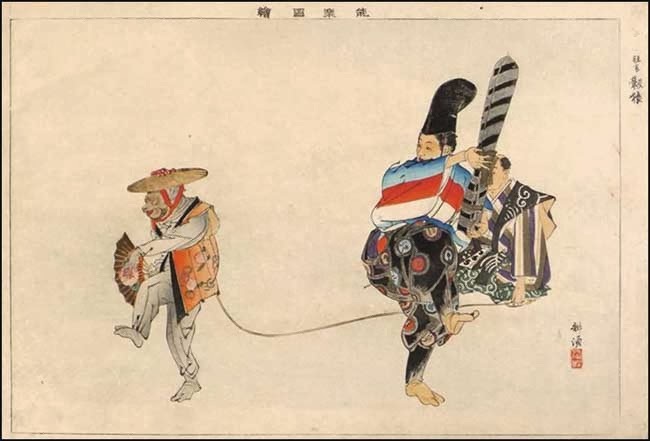 This technique is seen, for example, in the 18th century ‘onnagata’ dance ‘Sarashi Sanbaso’ (晒三番叟) and in such 19th century works as ‘Sarashime’ (晒女, also called ‘Omi no Okane’ 近江のお兼) and ‘Echigo Jishi’ (越後獅子).
. musume sanbasoo 娘三番叟 girl dancing the Sanbaso .
. Yamaguchi clay doll 山口人形 .
. Aichi, Inuyama dolls 犬山人形 .
. 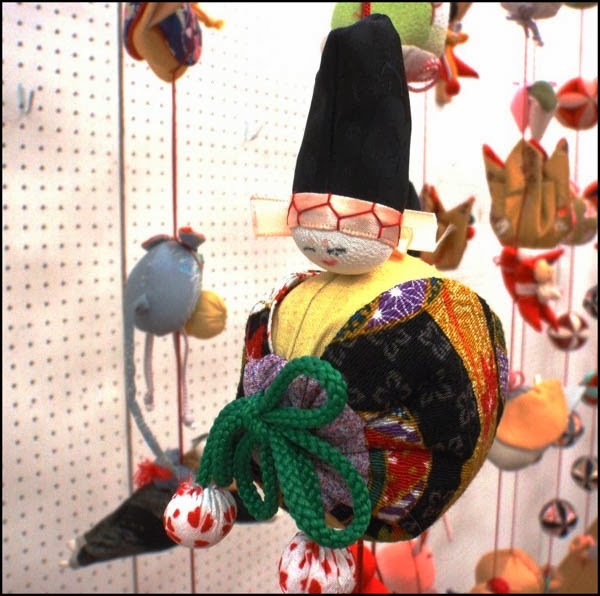 Folk Toys from Nagasaki . This is a special local tradition. 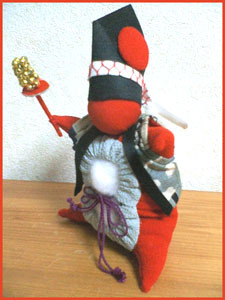 The puppets are carried around from house to house to wish luck for the New Year. 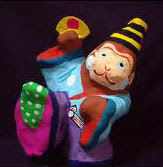 The puppeteers wear traditional robes with the family crest. Shinmeisha Shrine in the Naka area in Nishiizu Town, Shizuoka Prefecture, is an old shrine, which was relocated to the present place in 1600. 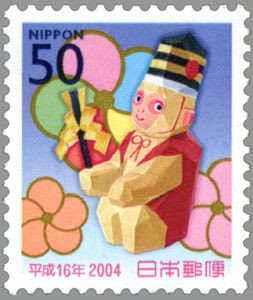 The Sanbaso dance dedicated at this shrine on the evening of November 2 and on the morning of November 3 every year is performed as a Japanese-styled puppet play (Ningyo-Joruri). 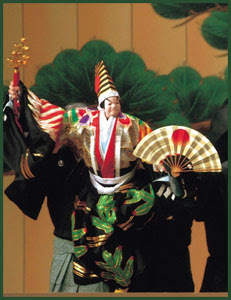 It is said that this is one of the Ningyo-Joruri performances that were introduced to this area during the Edo period (1603-1868). 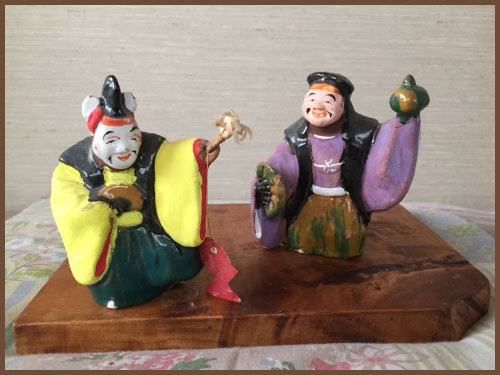 The doll performance is dedicated to give thanks to nature and to pray for a rich harvest, family safety, national peace and prevention of diseases. 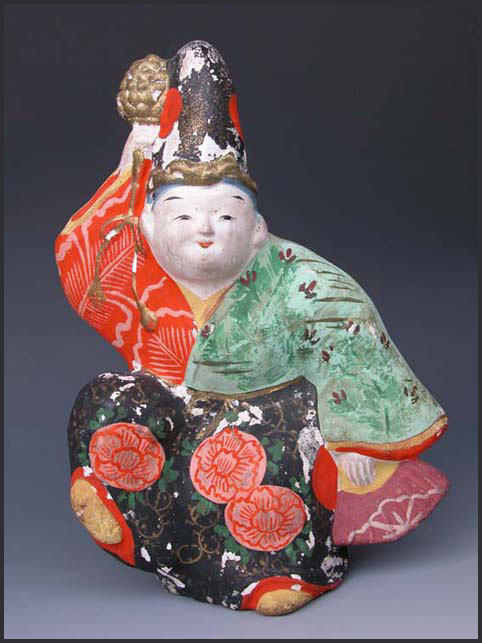 The dedicated play “Okina” is a drama in Kabuki style, which is originally a repertoire of the Noh play. 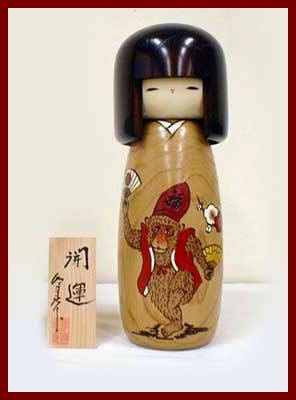 Each of the three dolls, Chitose, Okina and Sanbaso, is about 1 meter tall and operated by two local young men. Taking charge of operating different parts of the doll, the two doll handlers skillfully operate the doll and make it dance and perform the drama, which is breathtakingly beautiful. 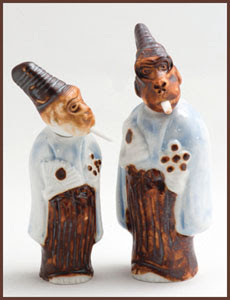 The movements of the dolls are so elaborate that you will feel as if a real man is acting as a doll. 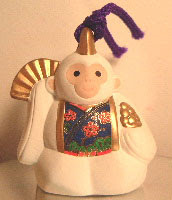 As a symbol for a happy event it is added to the dolls. Also with a wish for a good harvest and peace in the world. 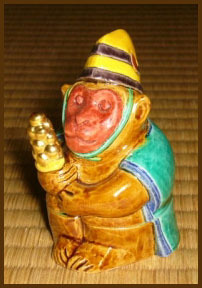 This is the young of the ishidai イシダイ, about 17 cm long. 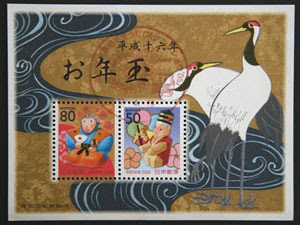 It tastes best during the winter time, the season of the Sanbaso dance. 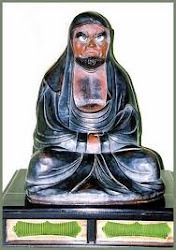 And it looks striped, like the eboshi hat of the dancer - or so they say. During the Shrine Festival on April 4. This dance is designated an important intangible property of folk culture by Chiba prefecture and is performed as traditional for a rice growing culture in the style of a beautiful Noh play.
. Ootoyo Jinja 大豊神社 Otoyo Jinja .
. Kyogen, kyoogen　狂言 .
. Sarugaku and Dengaku Dance . 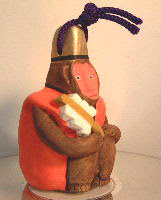 It was a joy to check out all these monkeys ... and there may be more to come, if I find the time.